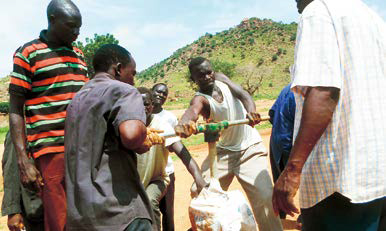 The number of internally displaced persons (IDPs) who evacuated from the conflict that began in 2011 and live around Kadugli is said to be about 70,000 (UNOCHA). We support improvement of the living and educational environment of IDPs with an emphasis on the relationships between the IDPs and host communities, face-to-face communication with the IDPs, and community participation. 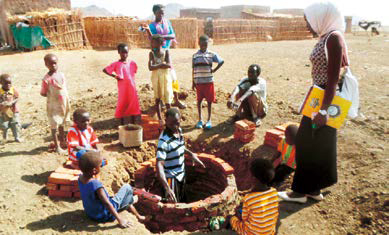 Children are watching how a villager constructs a latrine. JVC assisted construction of latrines in areas where many IDPs reside. IDPs who recognized the necessity of latrines through awareness events dug the pits by themselves and JVC provided technical advice and materials. Around 170 latrines were completed, which has not only improved hygiene in the areas, but also safety and practical aspects have been improved as it is no longer necessary for them to go outside the village to have a wash.
Training of repair and maintenance of wells. JVC installed three hand-pumps in the areas and schools where there are no wells in the neighborhood. An awareness event was conducted in four villages to explain how to use the hand-pumps properly and convey the necessity of maintenance. In addition, JVC provided technical training for members of water committees and held a joint workshop to share experiences related to repair of hand-pumps. These water committees have been organized by villagers to maintain and manage handpumps themselves. 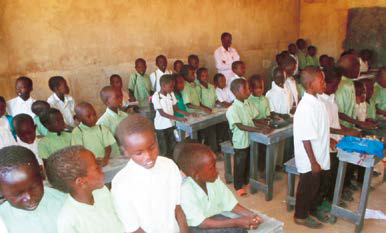 JVC provided desks and chairs to a primary school. Many IDP children do not have birth registration. Without a birth registration certificate, they have difficulty attending school and cannot receive medical expense exemption which is applied to children under 5 years old. Registration procedures become complicated in cases where the child has no father. JVC supports procedures for registration by coordinating with local authorities, and 914 children obtained the birth registration certificate. We also extended school buildings so that children who obtained birth registration can attend kindergartens or schools. School furniture such as desks and benches were also provided to those schools.